Your sofa and favorite armchairs get a ton of use from you and your family. Sofas and other upholstered furniture is often covered in very durable fabric in order to help it stand up to extensive use and help to hide dirt and grime. However, just because you can’t see the dirt and grime easily doesn’t mean it’s not there! Longevity & Durability – Those microscopic dust particles have jagged edges that scratch upholstery fibers like blades, causing fibers to lose their luster and making your furniture age prematurely and dramatically. 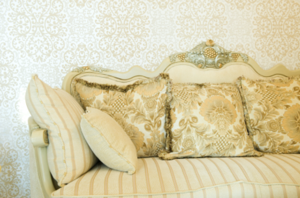 Keep your upholstered chairs and sofas clean in order to preserve them! Allergens – The most important reason to have your upholstered furniture routinely cleaned is to protect the health of your family. Dander, mold spores, and other allergens can linger in the fibers of your fabric and get buried deep in the padding. Dust mites might decide that your favorite armchair is also their favorite armchair and burrow deep into the cushions. Bacteria & Mold – Bacteria and pathogens can build up to the point where they’ll cause health risks to you and your family. Bacteria can get deep into the fibers of the upholstery. When it’s buried deep down, routine vacuuming or spot cleaning will not remove it, and you’ll need to deep clean your furniture or call on furniture cleaning professionals to steam clean it. Odor – It’s no secret that fabric absorbs odors. Kids, pets, shoes, and anything else that sits on or rests on your upholstered furniture likely leaves behind something that causes odor. Simply blasting the area with a bacteria-killing spray or an air freshener will not remove these deep-set odor-causing bacteria. Air Quality – Keeping your upholstery and upholstered furniture, carpet, and other such surfaces clean can help reduce mold, dust, mildew, dander, and other allergens throughout your home. Upholstery can act like giant air filters by trapping allergens and dust and holding them in their fibers and keeping them in your home and creating poor indoor air quality. Bugs – Here in Florida, even the cleanest and best-kept homes are visited by insects. It’s impossible to keep them all out all the time! Upholstered furniture makes great hiding places for insects. Fleas, dust mites, and even bed bugs are so tiny that you might not know you have an infestation until you and your family start getting bug bites. Cleaning your upholstered furniture regularly helps keep bacteria, bugs, and debris away, and keeps your furniture looking great. However, it can be tough to get the furniture really clean, and that’s where a great professional cleaning company comes in. First Coast Home Pros is the best upholstery cleaning company Jacksonville FL homeowners trust with their sofas, overstuffed chairs, drapery, and other upholstery. We provide deep, thorough cleaning, ridding your upholstered furniture of debris, bacteria, allergens, dust, and a whole host of other unwanted issues. We use extremely hot water, the best cleaning chemicals in the industry, and strong suction in order to leave your upholstery clean, soft, and sanitized. Riverside, Ortega, San Marco, Mandarin, and Jacksonville homeowners call on us time and time again because we’re the trusted professional cleaning company and the best in the business. Call today and let us give your home the thorough cleaning it deserves!